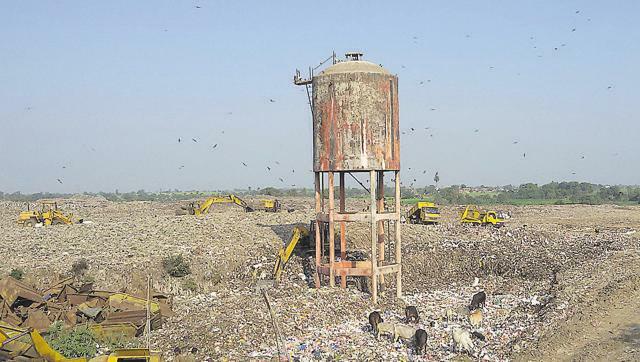 The MP government on Friday submitted a timeline for closure and capping of Bhanpur dumping site — Bhopal’s only landfill site. Senior government officials informed the National Green Tribunal that between July and October in 2017, the Bhanpur landfill site will be handed over to concessionaire (the holder of a concession or grant) for closure. They said transportation of Bhopal’s solid waste to the new landfill site at Adampur Chawni will also be started. Spread over 47 acres, every day over 600 to 700 tonnes of solid waste is dumped by the Bhopal Municipal Corporation at the Bhanpur landfill site. The timeline for the closure was submitted before the tribunal by counsel for the state government Sachin Verma, deputy director urban development department Nilesh Dubey and solid waste management expert KK Shrivastav. The NGT directed the state government to file an affidavit, which has the time schedule for the closure, and submit the steps taken so far with regard to the preparation of the new site as both these projects cannot be looked into isolation. The next date of hearing in the case will be on September 30. The landfill site has been operating illegally for nearly four decades. After locals started agitating against the existence of such a big landfill site so close to the heart of Bhopal city, the government decided to shift it site to Adampur a few years back. In 2014, the NGT ordered that the landfill site be scientifically closed and repeatedly stressed in the hearings that there should be no burning of the waste at the site.